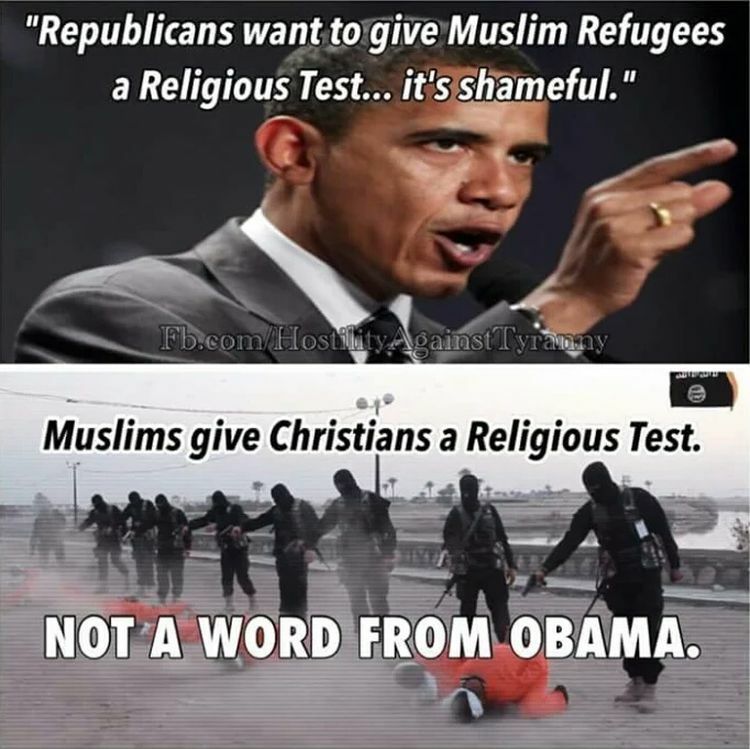 When President Obama attacks Republicans for suggesting that there be a “religious test” for refugees resettling in the U.S., he claims it’s “shameful” and “un-American.” He’s lying to you. The fact is, as National Review points out, a “religious test,” or determining the religion of refugees entering this country, is not only “American,” it’s required by federal law. In addition, the person applying for “refugee status” must actually be a “refugee,” as defined by federal law. That definition (set forth in Section 1101(a)(42)(A) of Title , U.S. Code) also requires the executive branch to take account of the alien’s religion: The term “refugee” means (A) any person who is outside any country of such person’s nationality … and who is unable or unwilling to return to … that country because of persecution or a well-founded fear of persecution on account of … religion [among other things] …[.] The law requires a “religious test.” And the reason for that is obvious. Asylum law is not a reflection of the incumbent president’s personal (and rather eccentric) sense of compassion. Asylum is a discretionary national act of compassion that is directed, by law not whim, to address persecution. Just because one comes from a country ravaged by war doesn’t automatically entitle them to “refugee status.” There must be evidence of persecution. It’s clear – and stated – that ISIS is persecuting and singling out Christians. They’ve said so explicitly. And while ISIS seems to have no problem if Muslims are killed in the process, they’re not ISIS’ primary target. In fact, they want compliant Muslims to live in ISIS-controlled territory under their caliphate. Obama prefers not to dwell on the distinction between the jihadist treatment of Muslims, on the one hand, and of Christians, Jews and other religions, on the other hand, because he — like much of Washington — inhabits a world in which jihadists are not Islamic and, therefore, have no common ground with other Muslims … notwithstanding that jihadists emerge whenever and wherever a population of sharia-adherent Muslims reaches critical mass. But this is sheer fantasy. While there is no question that ISIS will kill and persecute Muslims whom it regards as apostates for refusing to adhere to its construction of Islam, it is abject idiocy to suggest that Muslims are facing the same ubiquity and intensity of persecution as Christians.